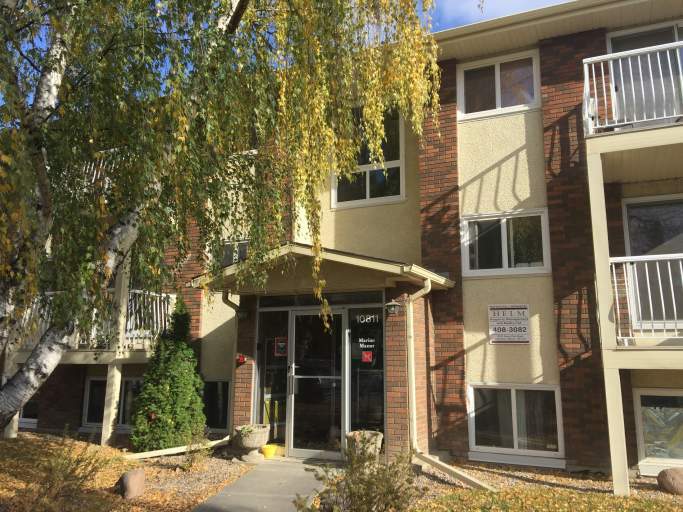 Located in the heart of Queen Mary Park this beautiful condo building offers proximity to Macewan University, NAIT and Kingsway Mall, meaning the LRT line is just minutes away! Plus with 107th Avenue just a block away, restaurants, cafes and retail shops are within walking distance! This is the perfect location for students and commuters alike! The building offers an uncovered energized parking lot and access to one stall is included in the rent, as well as secured entry and coin laundry services. The suite features modern laminate flooring throughout, meaning no more stained carpets!! Plus with the neutral paint color and large windows this lower level unit is filled with natural light, making it truly feel like home! The spacious kitchen is complete with a full size fridge and stove, and offers plenty of cupboard space. There is a large dining room just off the kitchen which opens into a massive living room, which is large enough for any furniture combination. The spacious bedroom has a large closet with mirrored doors, there is one full bathroom complete with a tub shower and even an additional storage room! The water and gas utilities are included in the rent, meaning you only pay for your own power! Call today to view this unit!